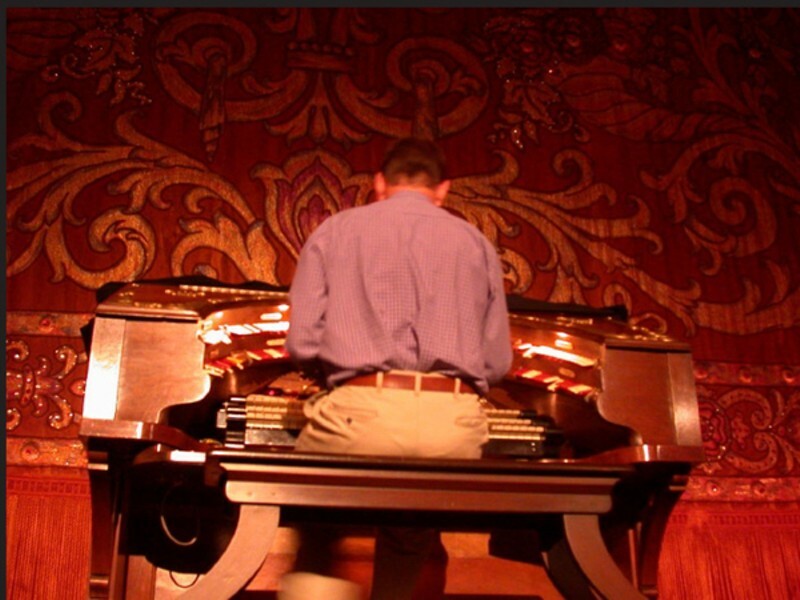 Who Is the Mysterious Organist Behind Grand Lake Theater's Mighty Wurlitzer? Gordon Pratt fulfills a lifelong dream at the historic Oakland movie house. Kevin King, one of the rotating organists, plays the Mighty Wurlitzer. The organist settled at his instrument while moviegoers shuffled in. Emboldened to gab and dispatch final text messages by the theater lights — which hadn't yet dimmed enough to signify "hush" — the attendees sat facing the musician's backside. A jacket lay next to the organist on a wooden bench. Only the back of his striped, short-sleeved button-up was visible, cradled in the instrument's semi-circular array of keys and switches at the foot of a massive, bejeweled curtain. Gilded decor was all around the organist, resplendent regalia peeking out from each crevice. Then the music began. In vivid stereo, the Grand Lake Theater's "Mighty Wurlitzer" organ emitted a playful number, with bright, sustained root notes punctuated by quick runs. The platform rose higher to show the organist's foot swinging like a pendulum between bass pedals. The next piece sounded like a brisk jaunt, followed by a calmer, idyllic number that evoked pleasant strolls before something funny happens. People clapped, but they kept chatting, too. The half-hour of organ selections featured a mélange of cheer: jovial passages, celebratory flourishes, and tipsy, meandering contentedness, all conjured and marshaled into the theater by a spry man in his seventies named Gordon Pratt. Pratt, who has played the theater organ before evening shows on weekends for more than ten years, ordered a hot dog and a soda from the concession stand after his first set. The lobby lighting illuminated his neat coif; his breast pocket was stocked with pens. "Tonight I played Cole Porter and Richard Rogers," he said. "It's different every time, though. ... It's all spontaneous, especially when the keys stick." Some latecomers opened the theater door and the sounds of a movie preview blasted into the lobby. "It's improvised. It's organized improvisation." It wasn't clear whether or not he meant to pun. Pratt grew up in the Bay Area, in a musical household. He took accordion lessons as a kid. One day, he saw a Wurlitzer organ being installed at Ye Olde Pizza Joynt in Hayward. The next time he went with his family to eat, it was in action. "I remember feeling enthralled," he said. "After that, I knew what I wanted to do for the rest of my life." Pratt and his father found an electric organ at Best Music in Oakland. His accordion training was easily transposed to the instrument. "I just sat down and taught myself how to play," he said. Pratt was already seated when the audience filed in. The organ bench faced him away from the crowd, anonymous, and Pratt never looked back. Though he's played the organ for almost his entire life, he's never been recorded. Each of his hundreds of unique interpretations remain ephemeral, confined to the theater, and always the opening act. At home, Pratt listens to classical organ music and popular fare by George Wright. He's a member of the Northern California Organ Society, which has access to the state's largest Wurlitzer, at the Berkeley Community Church. The society used to present organ programs for the public, but after a lawsuit over handicap accessibility, the events are now members-only. The Grand Lake Theater was built in 1926, but it isn't particularly self-conscious about its vintage appeal. Rather, it's quite pragmatic and populist, coupling family films with political documentaries, while the marquee frequently displays left-leaning commentary on current events. Matinee prices extend into the evening on Tuesdays. Yet, the organ remains a vestige of a bygone era, which Pratt warmly called the "old-time movie experience." Kevin King, Warren Lubich, Robert Reichert, and Pratt rotate organ duty at the Grand Lake. They're like a shadow staff. No one at the theater seemed to know their schedule or the best way to make contact. With artists like Pratt, management is unnecessary. Some employees did feel compelled to mention that an organist died at the keys during Star Wars reissue's opening night in 1997. It was sold out. No one recalled her name. The only way to find Pratt was to stalk the lobby after he played but before the feature film started, which he usually watches in between sets. Pratt said that hardly anyone approaches him to discuss the performances. Although he received a $20 tip for the first time that night. Pratt's finale was the musical equivalent of the theater's art-deco ornamentation — golden and radiating redolence. The organist's arms reached every which way and his leg swung with fury. He navigated high up the scale and stopped on the most exuberant notes while the platform started to descend and the lights dimmed. The music stopped once he dipped nearly out of sight. His silhouette was visible against the parting crimson curtain, then it disappeared — and the show began.